On 2 February 1994, one of the most important games in the Sonic the Hedgehog franchise was released on the Sega Mega Drive (Genesis) in North America. Sonic 3 was the highly-anticipated sequel to 1992’s global phenomenon that was Sonic the Hedgehog 2, and brought with it a tonne of new features and updates that not only gave the blue blur a fresh new appearance but also ushered in an era of ‘Sonic Mania’ that took the Western world by storm. The follow-up to Sonic 2 was tracked with huge interest by gaming media and newspapers alike – the latter realising that kids around the world were embracing SEGA’s mascot like never before. At one point during the early 1990s, Sonic was more recognisable than Disney’s own Mickey Mouse – and despite there being next to no news on the Sonic 3 project throughout 1993, strong merchandising and brand licensing made sure that mainstream media understood the brand power of the speedy hero come early 1994, when SEGA finally started teasing prototype images of Sonic’s next big adventure. ‘Big’ is also a little bit of an understatement, as the game was famously so huge in scope that it couldn’t fit onto one Mega Drive cartridge. Sonic Team, consisting of an almost completely refreshed Japanese team led by original Sonic programmer Yuji Naka, decided to split the entire Sonic 3 adventure into two; the second half of the epic would be released in October 1994 as Sonic & Knuckles. But there was more to be excited about than just the sheer size of the game. 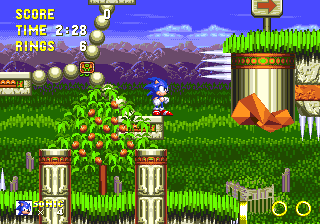 Unlike Sonic 2, which largely kept the same aesthetics as the original 1991 game with a few tweaks here and there, Sonic 3 was a complete visual and technical overhaul. The graphics were updated to give Sonic and Tails a brand new appearance and personality, stages were expanded to include a myriad of routes, and new level gimmicks gave each Zone its own unique flair. For a kid growing up in the ’90s, Sonic 3 (and its follow-up Sonic & Knuckles) represented the ultimate pay-off in waiting more than a year for a true sequel to Sonic 2 and arguably, with Sonic & Knuckles locked-on, the absolute apex of the Sonic the Hedgehog franchise. There have been good and great games in the series since then, of course, but none that have offered the combination of excellent gameplay, level design and concise yet epic storytelling that this ambitious mid-90s project offered. So here’s to 25 years of Sonic 3 (and we’ll probably do this all over again when Sonic & Knuckles’ anniversary rolls around)! You can reminisce with us by posting your favourite things about the game in the comments section below (we will make a post featuring the best of them, so give us your insights and you might make it on these pages), or check out our legacy coverage of Sonic 3 by clicking here. We’ll have more Sonic 3-related features and articles going live over the next week, as and when we can. Enjoy! Sonic 3 is my favorite 2d Sonic game. There’s so much I adore. The soundtrack (which includes so many different artists) sounds awesome, especially the MJ music which made it into the final game. The cutscene transitions help produce better story progression. The Opening custcene where Knuckles steals the chaos emeralds from Sonic & Tails (animated by Takashi Iizuka) is one my favorite Sonic game custcenes of all of time. So iconic. The introduction of the mid-zone bosses, The mid-zone transitions helps make each stage feel like one big zone rather than completely separate acts. The awesome elemntial shields which enhances the gameplay. The larger zones and more detailed stages with much better design. The Big Arm Boss is one of the most tense and exciting boss fights which still makes me nervous everytime I play it. Blue Sphere special stages are so rad. I could go on… Amazing game! Wow 25 years! In that year I turned 4 I moved to a new house and my older brother got a megadrive for his Bday which came with Sonic 3 and that was my first moment with the Sonic franchise. Sonic 3 & Knuckles still to this day is my favourite game of all of time. i never liked Sonic 3’s sprites and of course never got past the barrel – i stick to Sonic 2. I’m born in Jan 1994. 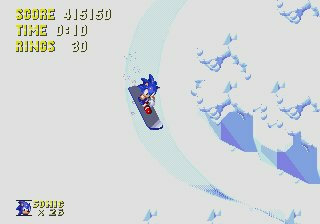 Sonic 3 in Feb 1994. Me and Sonic 3 are the same age. What’s ironic is that many people want to see this game re-released, but Sega’s not doing it because of copyright issues surrounding the music for it.